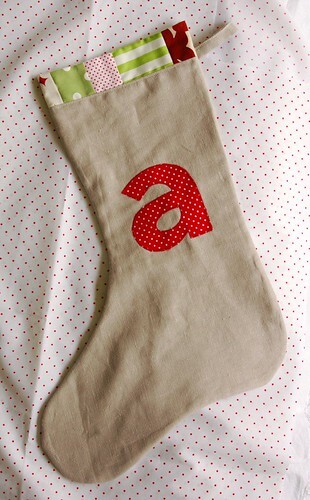 i've wanted to design a simple christmas stocking for years now and all these markets have spurred me on. classic, natural linen with a festive patchwork border and personalised applique, these are a good size for stuffing with little goodies and to be used for years to come. i've popped a listing in my etsy shop for preorders - you order one with your initial of choice and i will make it up and send it out to you no later than december 1st so that it arrives in plenty of time for christmas eve. i don't know how many preorders i'm going to take yet, it will depend how many i get from the markets so if you're keen, head over there and place your order now! ps. sorry the photos aren't great, it's been a rainy, grey week in old melbourne town. I've popped in to your blog a few times before, but I'm extra glad I did today. Your work ethic has woken me up from this evening's internet browsing coma. 'Puter is switching off ... sewing machine is switching on. Thank you. 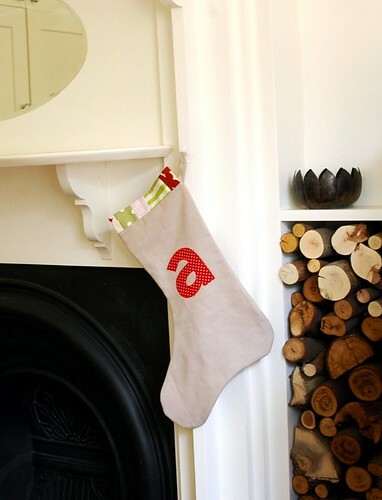 The stocking looks great - I still use the one my mum made me when I was small! I love the stocking! Its similar to one I made last year for my little boys first Christmas nice and simple with linen but the applique gives it a really great touch. Was just thinking of making miss A one at our sewing weekend!! !